Our brilliant bird guide, Adilei, is well known to our birdwatching friends and visitors, but what they do not know is that he is most devoted to his parents and on days off likes to spend time with them and the rest of his family. 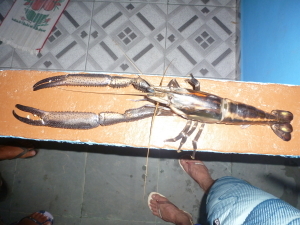 Last weekend Adilei’s brother-in-law caught a fresh water prawn, or Macrobrachium carcinus, commonly known as a ‘Pitu’. It was roughly 30 cm in length and close to a kilo in weight, the proportion of a lobster and a meal in itself! This large crustacean feeds exclusively on small fish, insects and leaf litter and is a good indicator of high quality water. We are only saddened that when found they are immediately collected, adding to their rarity. Most of the locals talk wistfully about this freshwater crustacean, as many of the streams within the Guapiaçu watershed close to small villages have been fished out, and the days of big fish in the rivers has become a thing of the past. So when an example of this species is found it is a source of much entertainment in the local villages. Although the species is locally threatened in the Atlantic Forest, it is it very widely distributed, ranging from Florida south to southern Brazil, and also found in many of the Caribbean islands, and therefore classified as Least Concern by the IUCN.